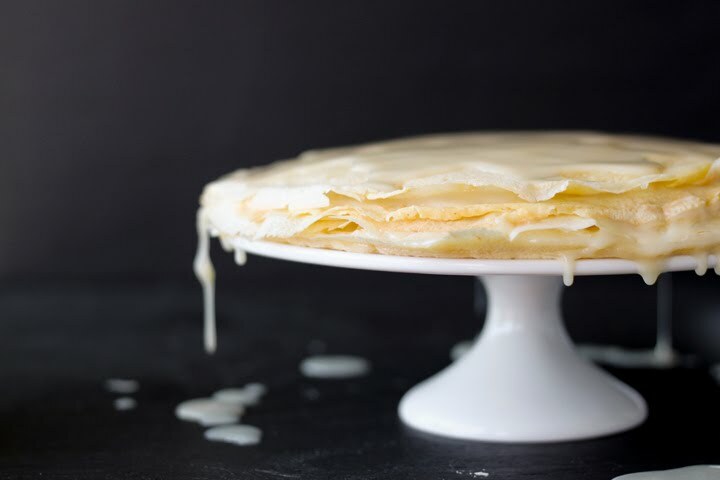 Crepe Cake — always with butter. I love crepes. They are so simple and delightful, and I always feel so Parisian when I eat them. So thin and can be paired with almost anything. This cake turned out to be kind of a wonderful disaster. I was doing fine with making the ganache and I had made all the crepes but I guess I didn't let the ganache cool enough. So it started to run all down the sides! So it is not as thick in between each layers as I would have liked it to have been but still tasted great nonetheless. In a large saucepan, bring cream, sugar & salt to a boil. Remove from heat and add chocolate. Let sit for 5 minutes without stirring. Whisk until smooth. Let chill in fridge until completely cooled. A few hours. Whisk together all ingredients until smooth. In a medium pan, over medium heat, grease pan. Pour about 1/4 cup of batter in pan, swirling to make a thin layer over the bottom of the pan. Cook for about 1 minute on each side, until lightly browned. Let crepes cool completely. Once ganache and crepes are cooled, begin to layer them. Crepe, thin layer of ganache, crepe, etc. Repeat until all crepes are used. Pour remaining ganache over cake and pile on raspberries. Chill for 1 hour before serving.